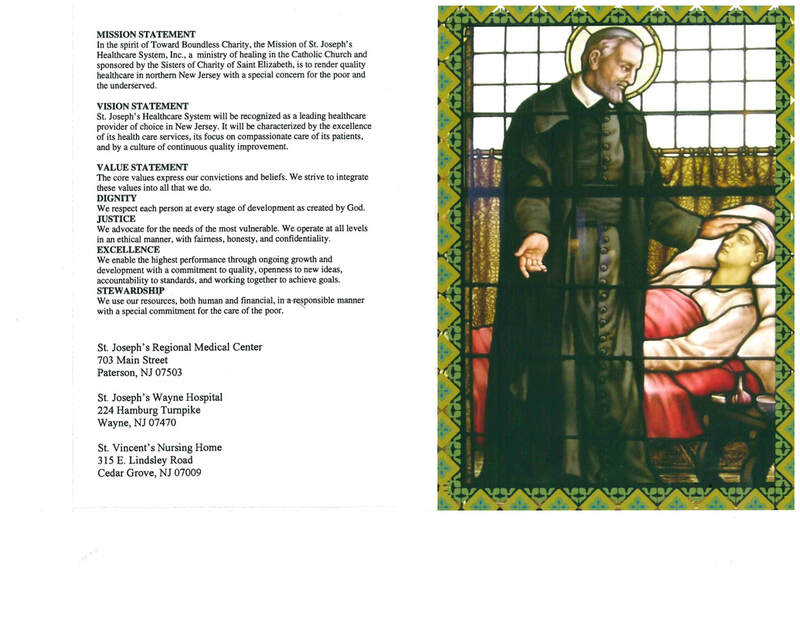 Sister Loretta Agnes Weingart served the Sisters of Charity at St. Joseph's Hospital for decades. 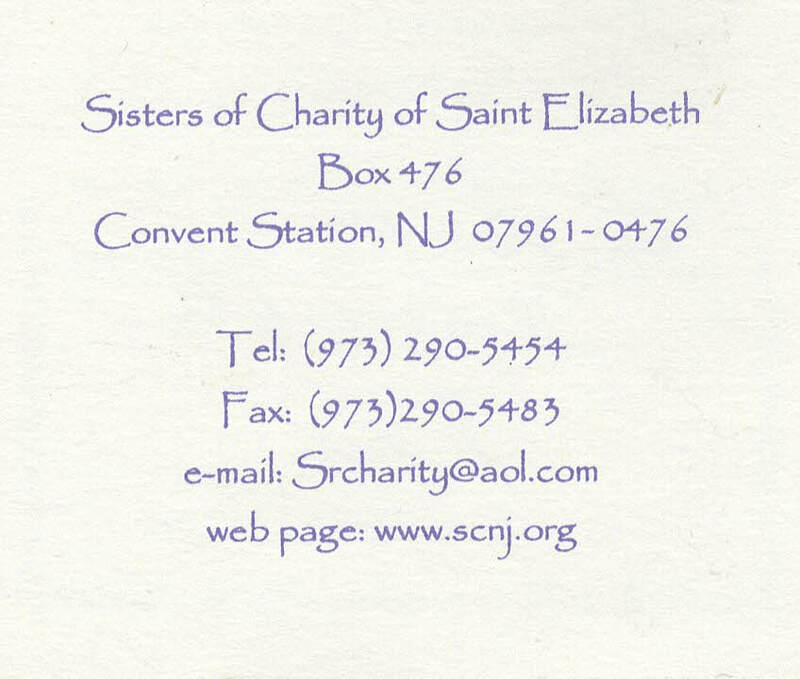 The Sisters of Charity were founded by Saint Elizabeth Ann Seton in the spirit of Saint Vincent de Paul and Saint Louise de Marillac in Emmitsburg, Maryland, in 1809. 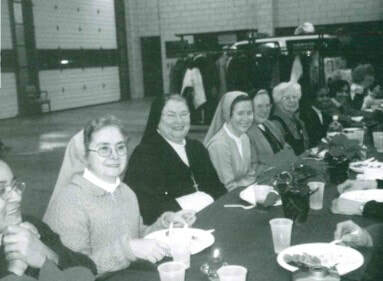 In 1859, Mary Xavier Mehegan, a Sister of Charity of New York, at the request of the Bishop of Newark, founded the New Jersey Community known as Sisters of Charity and moved the Motherhouse to Convent Station. 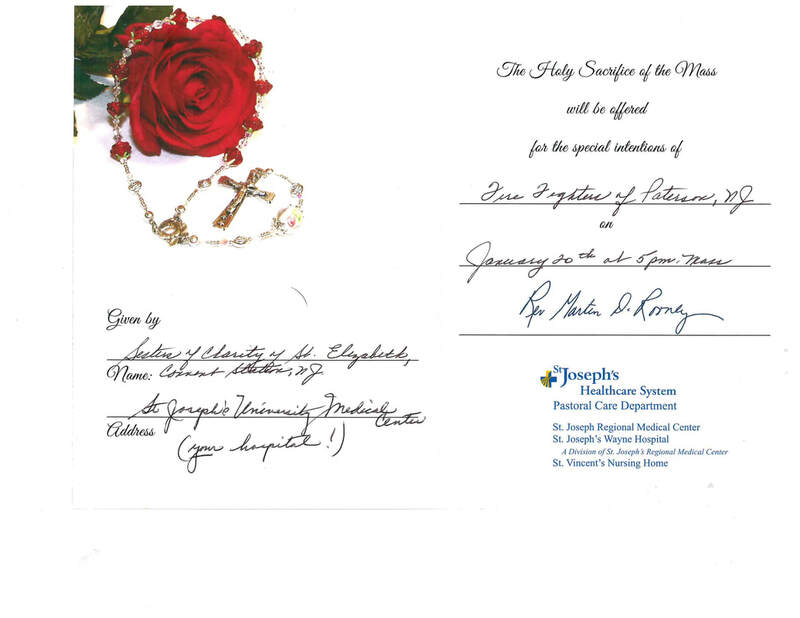 Seven years later the Sisters sponsored the opening of St. Joseph's Hospital in Paterson. 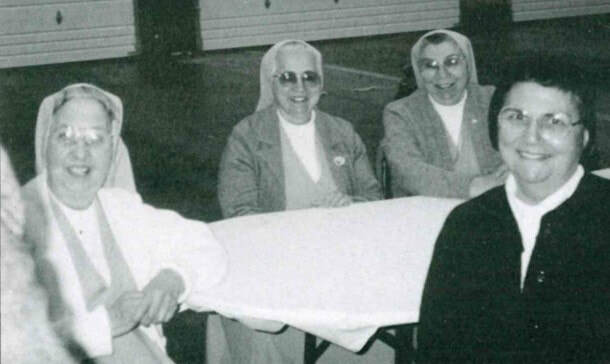 Sister Loretta first worked under Sister Anne Jean and then Sister Jane at St. Joseph's. 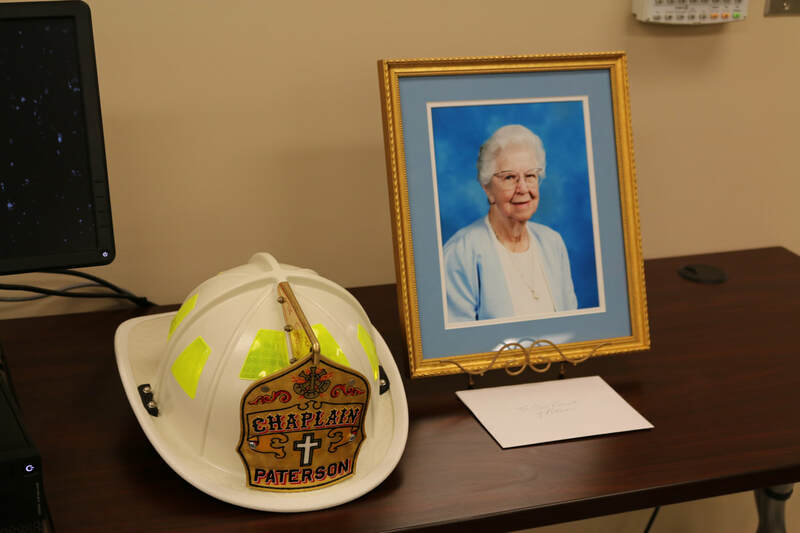 ​Over that time period she nurtured a special relationship with the Paterson Fire Department and became a Guardian Angel for any ill or injured firefighter. 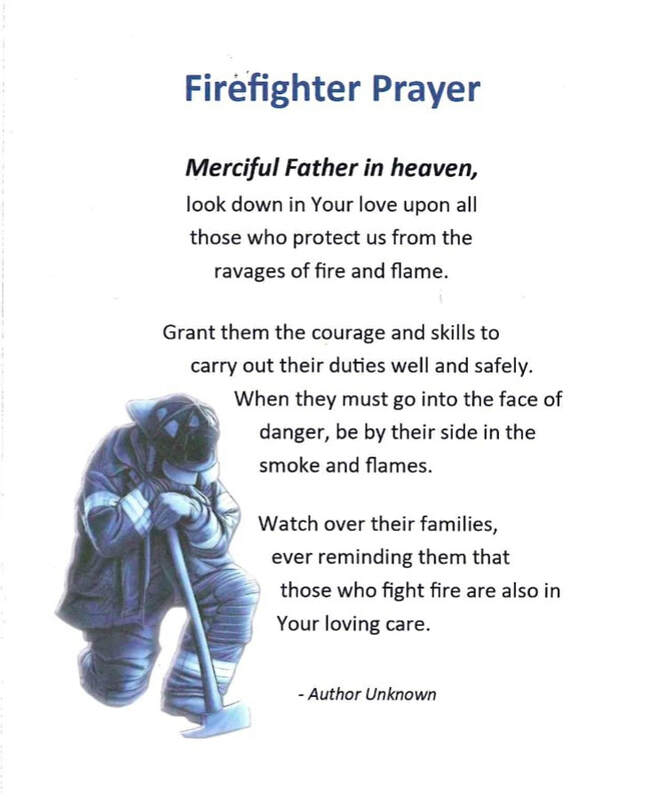 She had kept vigil in the ER, ICU or floor for any injured or ill firefighter or their family. 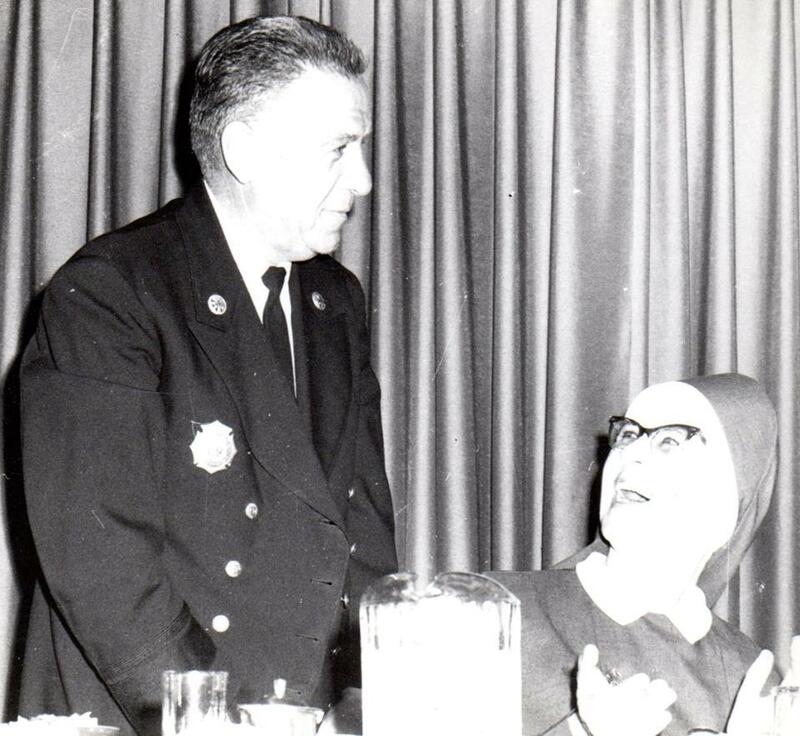 1968: Paterson Fire Department Communion Breakfast at Tree Tavern. 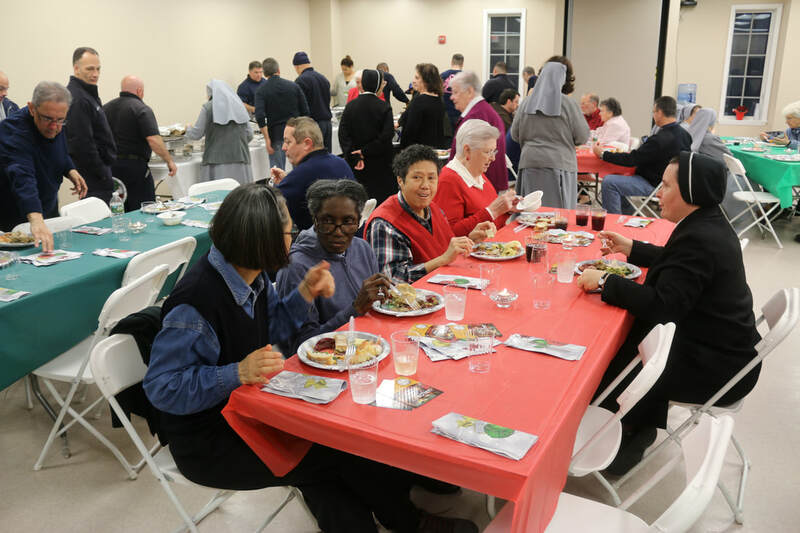 Sitting L-R Commissioner Edwin Englehardt, Bishop Casey, Sister Loretta Agnes, and PFD Chaplain Doyle. 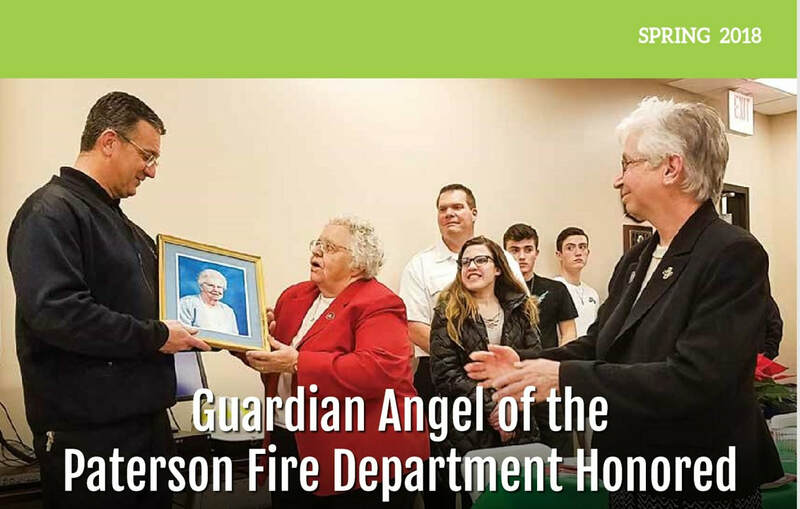 Standing L-R are Fred Ricciardi (FMBA President), Ken Hayden (Fire & Police Commission Secretary), Mayor Pat Kramer, Assistant Chief Gerard Dugan and Assistant Chief Joseph Dayspring. 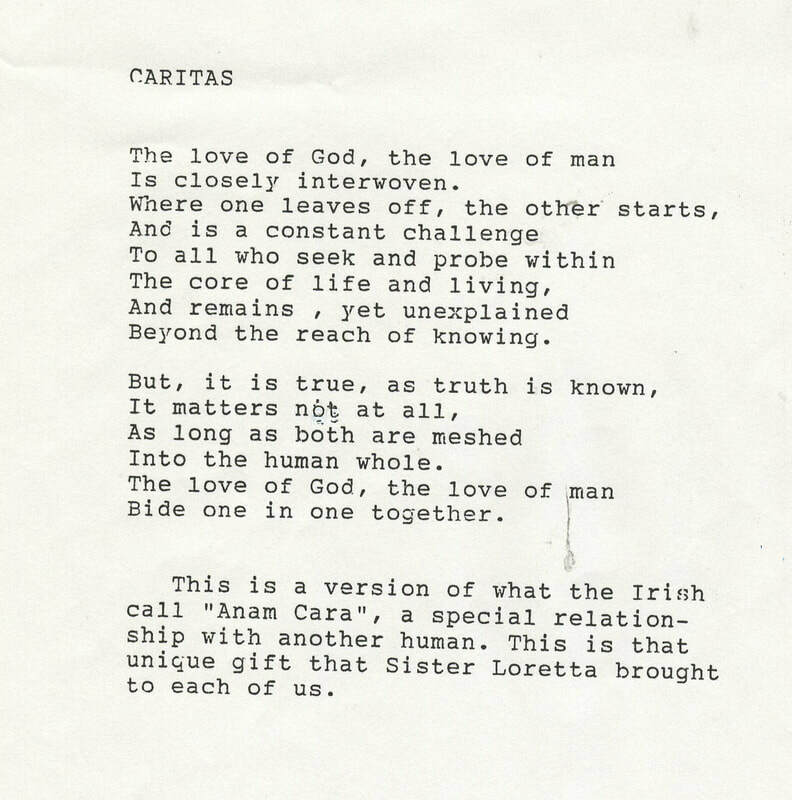 May 25, 1971: 9:00 PM From the Journal of Ambulance 94. 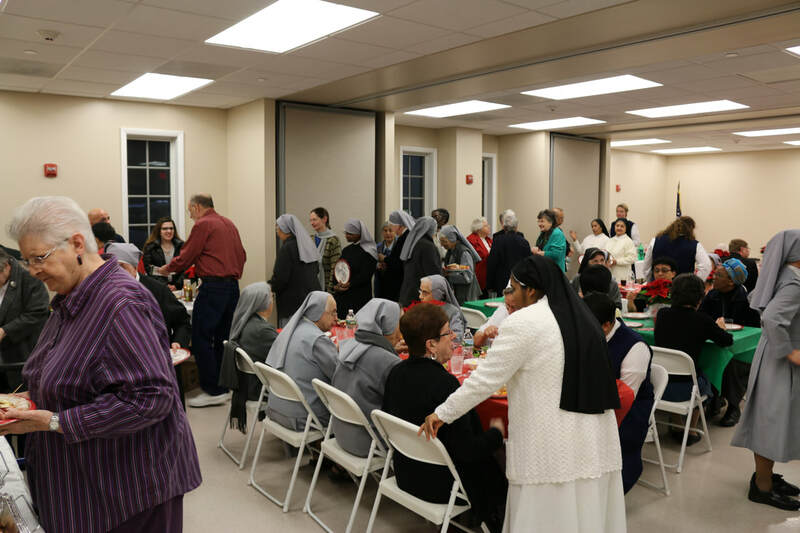 To check on operations, Sister Loretta Agnes, accompanied by Assistant Chief Dayspring (Director of the Ambulance) visited the Riverside Firehouse to observe operations of the newly opened unit. 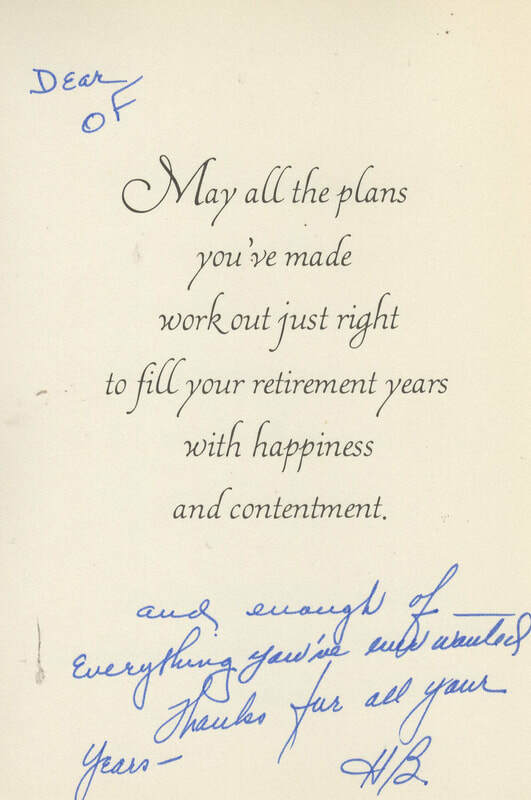 1981: Sister Loretta sent a card to Assistant Chief Joseph Dayspring upon his retirement: Note that she addresses the Chief (her very close friend) in an unlike-nun way as "OF" (old -F___) And she signs the letter using the nickname that the Chief often called her - "Holly Bones"
The Christmas Dinner was started sometime in the 90’s while Sister was still alive by BC Glen Vetrano (who was also the Union President at the time), with chef Robert Santee and Chief James Pasquariello. 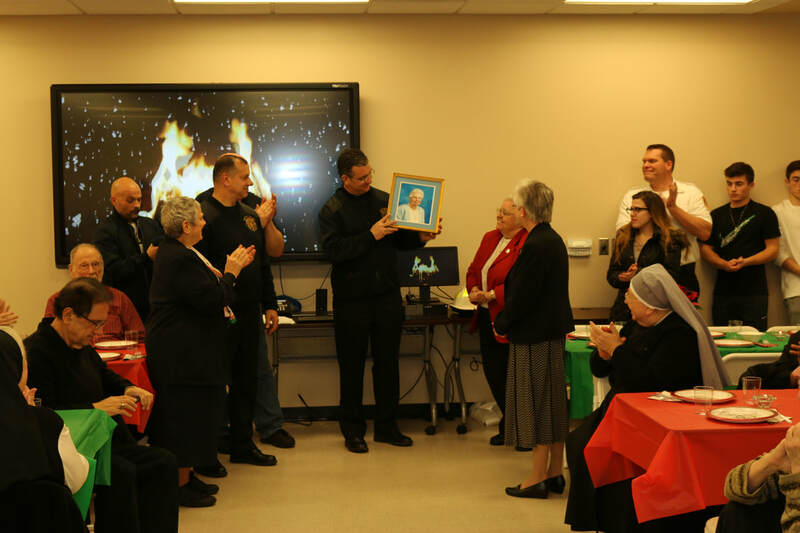 The tradition began as a way of thanking Sister Loretta, for her many years providing caring and spiritual support to injured/ill Paterson firefighters at St. Joseph’s Hospital. 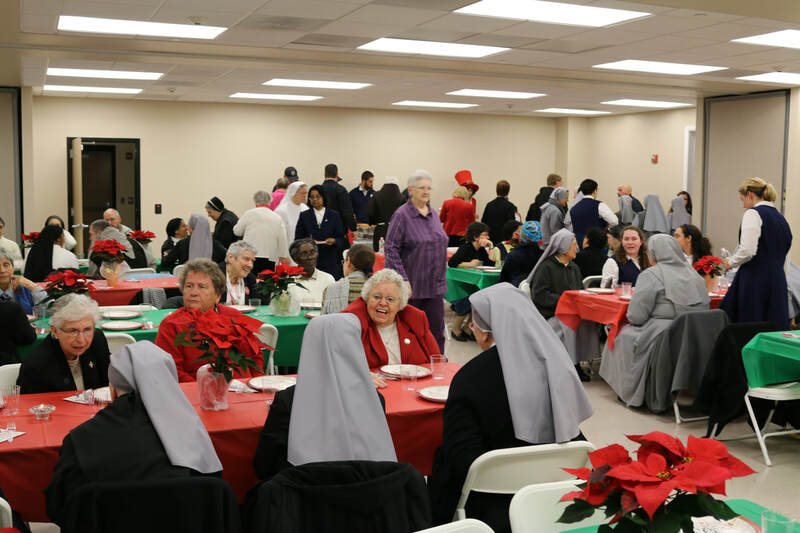 Initially she and a few of the clergy were invited to Fire Headquarters at 850 Madison Avenue for a very informal Holiday lunch/dinner. 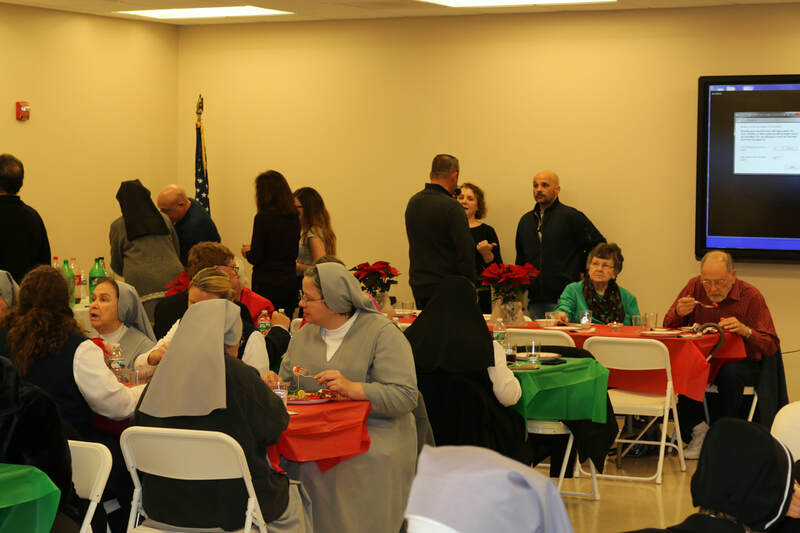 The event continued each year, and became a tradition with more and more clergy being invited & attending. 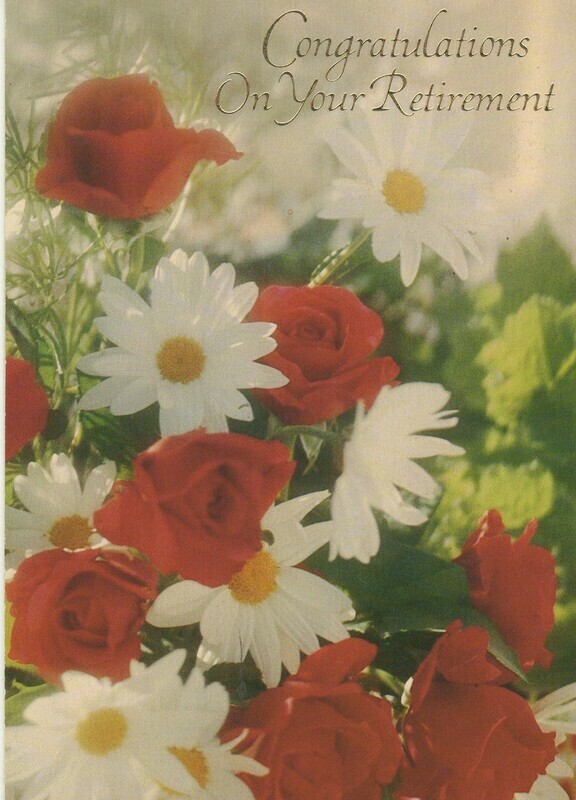 ​It got to the point that Madison Avenue was no longer big enough to host the event. 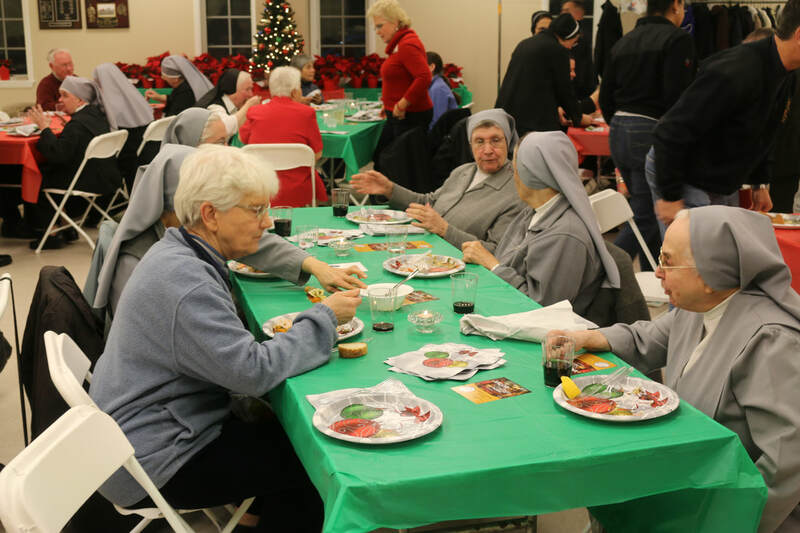 Consequently, the dinner was moved to St. Bonaventure’s Church Hall for a few years. 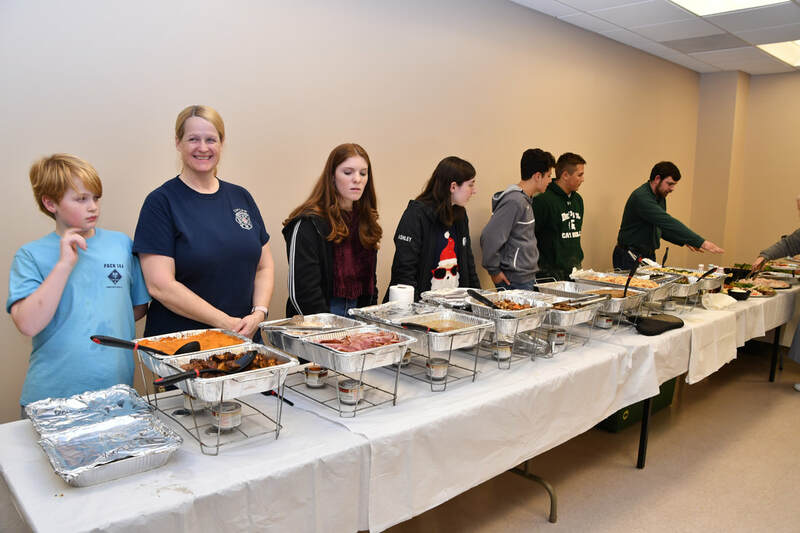 Once Headquarters was relocated to 300 McBride Avenue, we moved the event back to the firehouse. 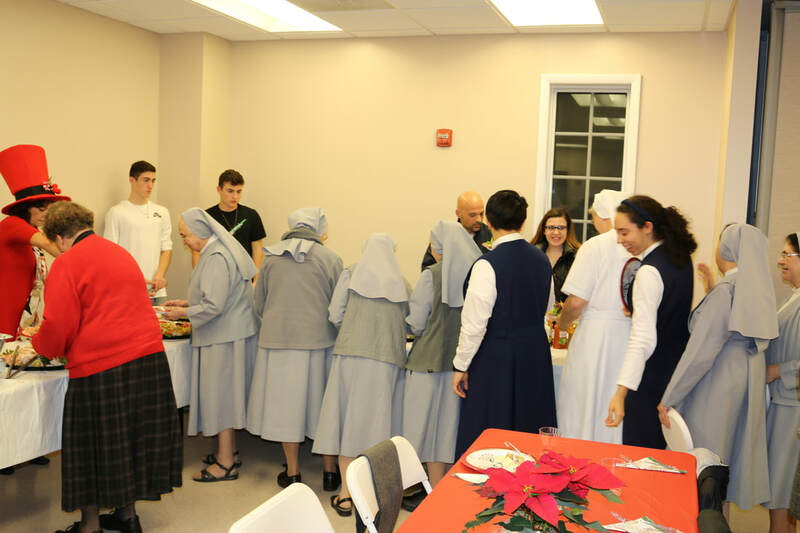 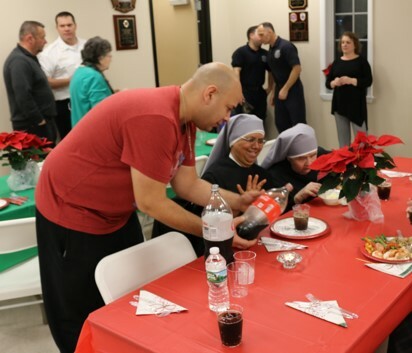 After her passing in 2002, the department has organized an annual commemorative Christmas dinner for the Sisters of Charity of St. Elizabeth and clergy at held Fire Headquarters. 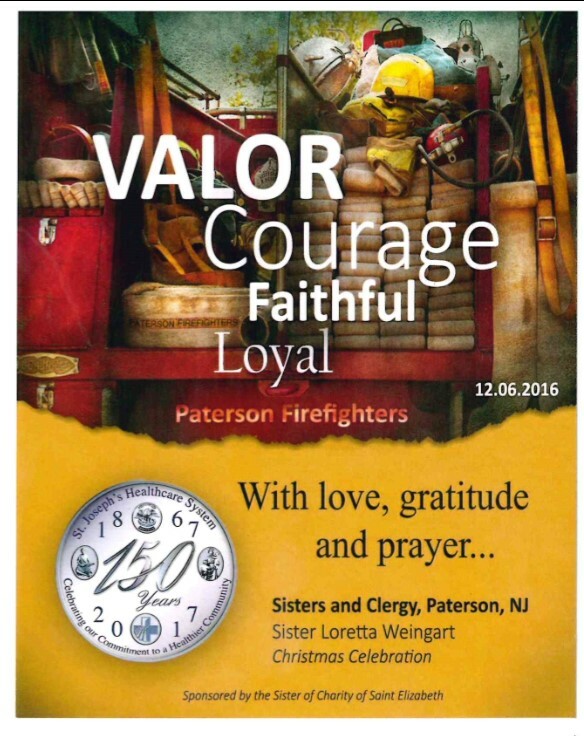 When Sister Loretta passed away in 2002 the Paterson Fire Department, Trommelen said, provided "casket watch" for her, a tradition normally reserved for firefighters. 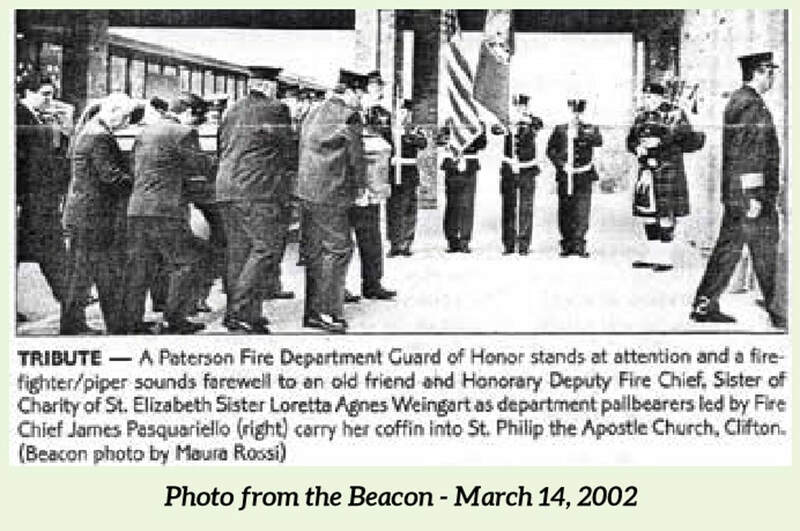 March 27, 2002: Letter from retired Assistant Chief Joseph Dayspring to the then President of the FMBA re Sister Loretta which discuses the Eulogy the Chief delivered at Sister's funeral as well as the special relationship he had with Sister. 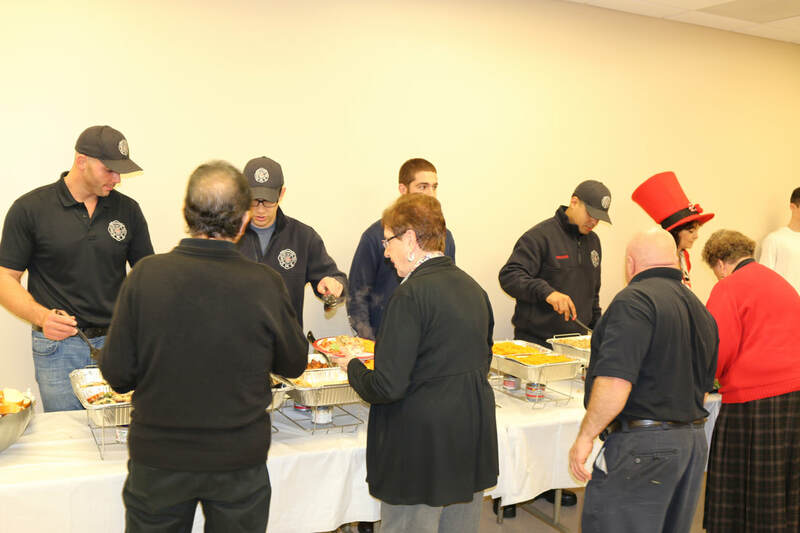 December 5, 2017 Christmas Dinner: over 80 persons attend.​ Event organizer was Captain Michael Trommelen with FF Ralph Veltre assisted by Capt. 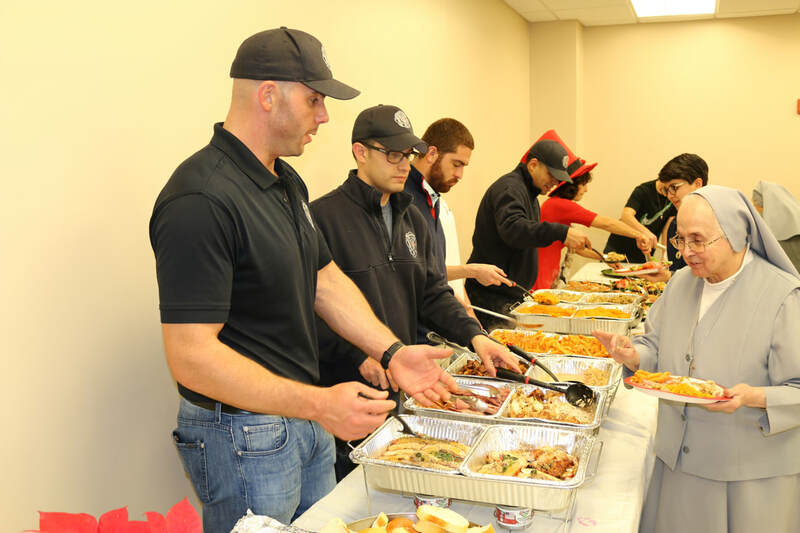 Joseph Statuto, Captain Jason Macones, & FF Michael Gallo. 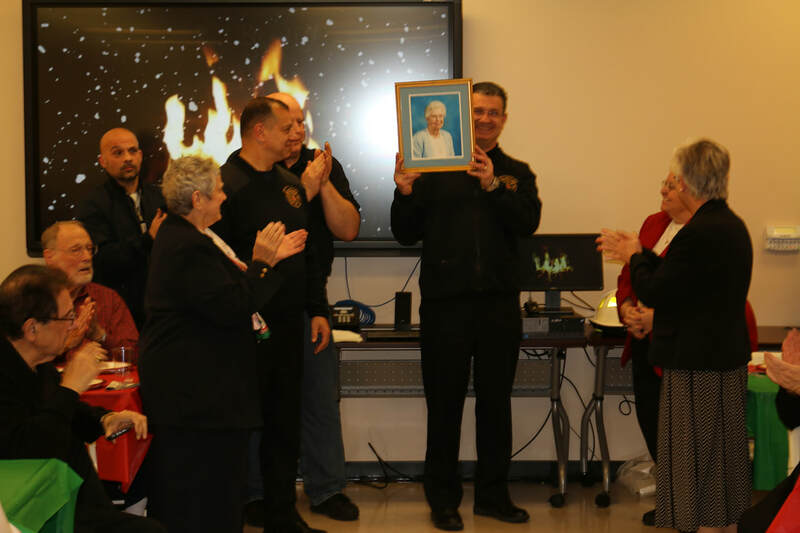 Chief Postorino showing the photo. 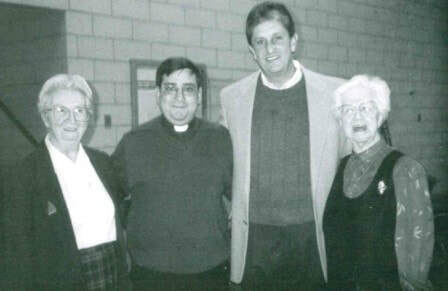 AT left BC Onorato, DC Hancock and Captain Trommelen.